Loredana and Iancu, parents of Iancu Jr (2) and his sister. Something utterly outrageous happened in Ireland these past few days that should make everyone deeply concerned over civil liberties there. Two children, one in Athlone aged-2 and one in Dublin aged-7 were taken from their parent’s arms and held in custody by police while their DNA was verified. 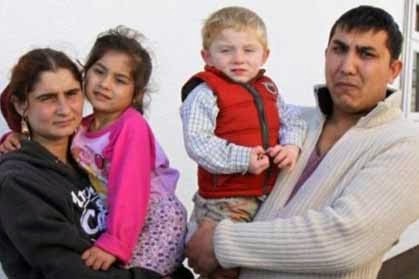 The involuntary taking of children occurred after a case in Greece, where a child was discovered who was not the natural offspring of the Roma parents. The Irish kids happened to be blond and blue-eyed and because their families were Roma gypsies there was deep suspicion that they had been kidnapped at a much younger age. But suspicion is not fact and for the state to intervene based on accusations from neighbors was clearly behavior beyond the pale. Heads should roll. Irish police were acting on tip-offs that the two kids did not seem to be the children of their parents. In both cases the Irish state moved against the families and sent their police force in to grab the screaming children. It was an act so irrational and so thoughtless and so damaging to the children and parents that it defies description. The mother of the seven-year-old did not eat for three days, according to her older daughter, and was distraught. The two year old boy was also distraught and “crying for his mother” when police came to take him away. Every big government opponent in America from the Tea Party on down could feel emboldened by this dreadful act. Both children it turned out, after DNA testing, were the natural born offspring of their parents. The state acted - despite the parents' tearful protests and the screaming children - in near fascist fashion and removed the kids from their parents. What should have been done, obviously if there were sufficient grounds for suspicion, was a quiet visit, a request for a DNA test, a result of that test and a quiet apology. Instead we had screaming headlines and a Roma community, already suffering from racist perceptions, being scapegoated by the state itself. Many years ago author Brinsley MacNamara wrote a book called “The Valley of the Squinting Windows” about the vicious gossip in a small country town later identified as Devlin, County Westmeath. That vicious gossip survived into the present, obviously, and it resulted in the state taking action against the most vulnerable citizens in a harmful and deeply hurtful way. This was not Ireland’s finest hour by a longshot.